Aberdour Castle lies close to Aberdour's railway station. It is a building that over a five hundred year period slowly moved from west to east with the successive building of new stages of accommodation more suited to the needs and aspirations of the owners of the day. The castle started life some time before the year 1200 as a two story tower house built by the de Mortimer family. 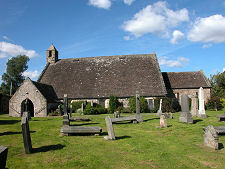 The evidence for this comes in part from a dispute in 1180 between William de Mortimer and the Priory of Inchcolm about filling a vacancy for chaplain in the neighbouring church, now known as St Fillan's. The first expansion of the castle took place in the fifteenth century, by which time it had come into the ownership of the Douglas family, the Earls of Morton. 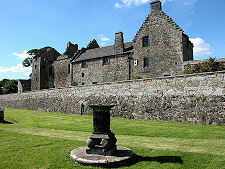 This increased the size of the tower house, and built a range of other buildings around a defended service courtyard. Remnants of the bakehouse and brewhouse can still be seen. Some of the outer defences from this time were lost (together with the original entrance to the castle) when the railway was built along the north side of the site in 1890. The first major move east took place under James Douglas, Earl of Morton, who was Regent of Scotland from 1572 to 1578. 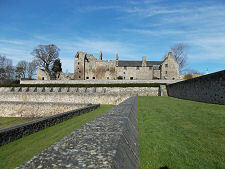 In August 1576, Aberdour's new central range (as it is known today) hosted a meeting of the Privy Council, who could at the same time have admired Morton's brand new terraced gardens, which are now being restored to their former glory. Morton was tried and executed in 1581 for his alleged involvement in the murder of Lord Darnley, husband to Mary Queen of Scots thirteen years earlier. Ownership of the castle - and title - passed to his nephew, and so stayed with the Douglas family. 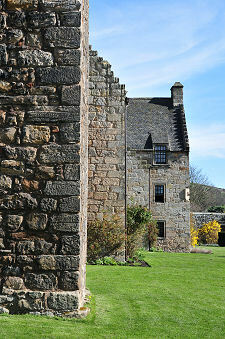 The central range was built on top of earlier buildings associated with the tower house, and marked the transformation of Aberdour from a primarily defensive structure into a primarily domestic one. 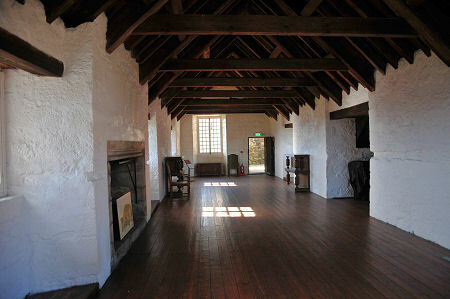 It had three storeys and was linked to the accommodation in the tower house, which continued in use. The final move east came in the 1630s. The Seventh Earl of Morton, who was at the time the Lord Treasurer of Scotland, built what is now called the east range to provide more modern family accommodation. This comprised an L-shaped extension that today is the only complete part of the building, housing the gallery on the upper floor and the tea shop and stable on the ground floor. Outside the castle are extensive gardens. To the east is the walled garden whose outer wall in part encloses nearby St Fillan's Church. To the south are the terraced gardens. These were only rediscovered in the 1970s and are now being fully restored. They are formed from four L-shaped levels descending in walled steps towards the sea. At their lower end lies the site of an orchard created in 1690. At the far end of the upper terrace of the garden is the spectacular beehive-shaped dovecot built at the end of the sixteenth century. This still contains over 600 stone nesting boxes. 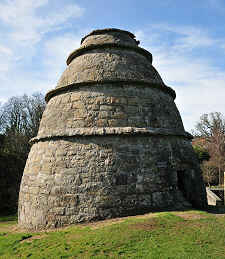 The purpose of the dovecot was to provide the household with a reliable supply of meat. It seems likely that rabbits were farmed near the dovecot for the same purpose. 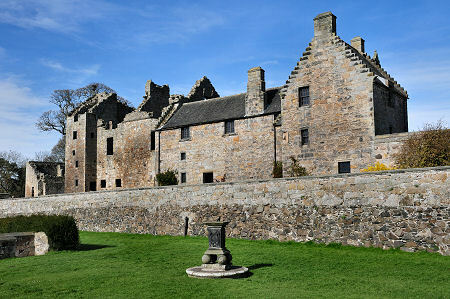 Aberdour Castle's demise started when it caught fire, probably in the 1680s. Ambitious plans for full repairs and a major expansion to the north into the inner courtyard were shelved. Instead only the east range was restored by 1703, leaving the central and west ranges in ruins. Rather than extend again or remove the ruins, the family decided to buy the neighbouring Aberdour House, and by 1725 they had effectively abandoned what was left of Aberdour Castle and moved into Aberdour House. 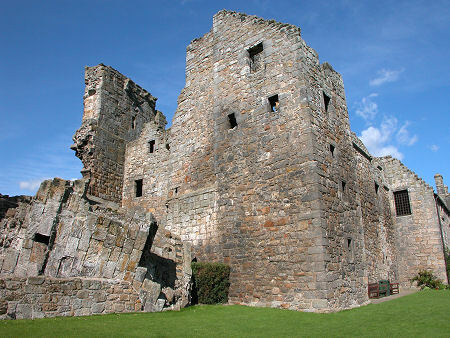 The east range saw a number of uses including as barracks and a school over the following 200 years, and in 1924 Aberdour Castle passed into the care of the state as an ancient monument. 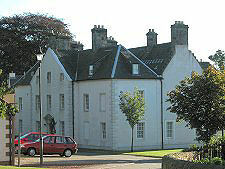 It is now cared for by Historic Environment Scotland.